If you are having a hard time finding professional Westland carpet services, The Carpet Guys are here to lend a helping hand. 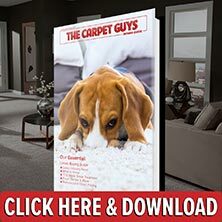 With The Carpet Guys, you can get new carpet installed from the best flooring specialists around. Our professional Westland carpet installers provide the best carpeting services that customers can receive. The craftsmanship that we provide for homeowners is superior, guaranteeing customer satisfaction. With the Better Business Bureau, we have an A+ rating and continue to maintain it. In Metro Detroit, the Readers Choice Awards voted for us as the best carpet store. We have been voted the best place to buy new carpet in the Macomb Daily Newspaper four years running. We have been awarded the Angie's List Super Service Award. If expert Westland carpet installation is what you are looking for, find it with The Carpet Guys. With us, you will find the best deals on carpet and unbeatable carpet specials. Take the time schedule a free in-home estimate today to get started. With our installers handling your carpeting needs, you will meet the best Westland carpet installers available. Our installers follow a very specific installation process to provide all customers with the best carpeting services they can get. Customer satisfaction is something we strive for, and our carpet installers provide it. Each job that we are hired for is treated as a special one, and the job is done correctly and professionally. Before our installers put the carpeting in place, they will remove the furniture out of the selected room or rooms for you upon request. They are there to serve, so it is the least they can do. After each room has been cleared of any piece of furniture, the carpet installation process can begin. The old carpet is removed and bundled up neatly and they are placed outside wherever they can await garbage pick up. After all of the old carpeting material has been cleared out, the subfloor can then be prepped. After prepping, new carpet padding is rolled out and the fresh carpeting is placed on top of it and installed. The remnants that are left over get taken out and upon the request of the customer, the furniture can be placed back into the original places. To hire the absolute best Westland carpet installers, fill out a free in-home estimate on our website or call in to speak with one of our friendly customer service representatives to get started. We appreciate your time and consideration of us as your carpet installation company of choice.